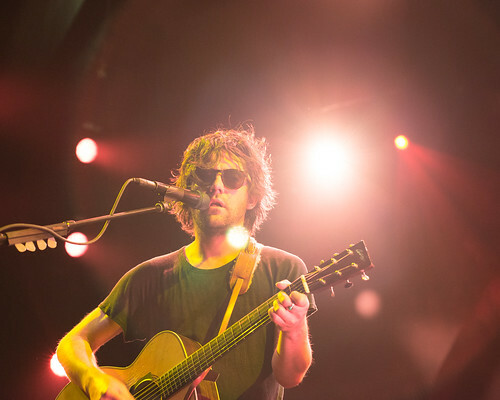 Before bringing the show to XPoNential Music Fest on Friday, Conor Oberst kicked off a weeklong tour with Philly’s Hop Along last Thursday in Brooklyn,playing the BRIC Celebrate Brooklyn Festival. The outdoor show took place at the Prospect Park Bandshell on a hot July night. New York’s Big Thief joined the tour for the night, opening the show with a handful of highlights from their 2016 debut Masterpiece and follow-up Capacity, released earlier this year to great acclaim. Highlights from the short set included the misleadingly upbeat “Shark Smile” (the partner of the song’s protagonist dies in a car accident) and the deeply personal “Mythological Beauty” (reflecting on an unmet older brother placed up for adoption and an almost fatal childhood accident). Entering alone, Frances Quinlan opened Hop Along’s set with a solo “Happy To See Me” before the rest of the band chimed in for “The Knock”, both from from 2015’s Painted Shut. “As tight as ‘Losing My Religion’ is, it was 5 a.m. and Joe and I realized we were recording a mandolin,” Quinlan quipped when explaining the band spent the previous seven weeks in the studio recording their next album, only finishing the morning before. The band’s relief at being out of the studio was apparent with an infectious joy charging their set of cuts from Get Disowned and Painted Shut, along with an as yet unnamed track from the new album. Hop Along’s ability to project power no matter the setting were well demonstrated with their one-two finale featuring the propulsive “Tibetan Pop Stars” and ambling “Sister Cities”. Before Conor Oberst took the stage a light rain began to fall, slowly increasing with intensity and providing a much needed break from the heat. With The Felice Brothers as his backing band, Oberst’s set highlighted tracks from his 2017 release Salutations. Selections from his extensive catalog of solo work sprinkled with a few Bright Eyes songs rounded out his set. He closed with I’m Wide Awake, It’s Morning’s “Train Under Water” and the raucous Salutations cut “Napalm”. Catch Conor Oberst and Hop Along this Friday at XPNfest, joining Wilco, Angel Olsen, Hurry, and more.